Two years ago when BLOODSTAINS was first published, author Jeff Mudgett was invited to speak to a writer’s organization in San Diego, Go, Be, Write, who meet to inspire and socialize with writers, editors, agents and other professionals in the business. Jeff Mudgett has been extended yet another invitation by the group to be held on Saturday, May 25 at Balboa Park in San Diego. Since his first visit BLOODSTAINS has become a best seller on Amazon Kindle, has sold a successful amount of print copies, and soon will be available in audio format. BLOODSTAINS has also recently been optioned by a Hollywood studio as a major film. Mudgett will share with the audience his experiences of self-publishing and marketing a successful book in today’s volatile publishing industry. He will speak about the best practices of marketing as a first time, self-published writer, what pitfalls he was able to avoid, as well as those he didn’t. The subject matter in BLOODSTAINS has many genre cross overs; true crime historical, memoir, paranormal, and psychological mystery thriller, receiving attention from all forms of media. Attendees will learn how Mudgett is able to make it happen. Author Jeff Mudgett’s gripping and mesmerizing writing style makes this story a real page turner. It’s a real credit to the author. He uses his ingenuity in masterfully placing a true story within a heightened dramatic context. The author’s journey is like a harrowing descent into a dark and demented rabbit hole. Bloodstains is the startling tale of one man’s search for the truth after inheriting the personal diaries belonging to his great-great-grandfather who he discovers was America’s first and most notorious serial killer Herman Webster Mudgett. Better known by his alias H.H. 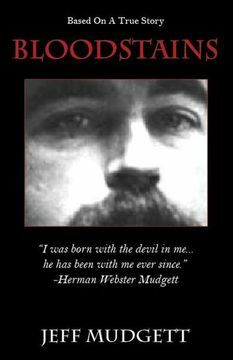 Holmes, Mudgett was the mass murderer who struck terror into the nation by being the proprietor of the infamous Murder Castle and stalking the streets of Chicago during the 1893 World’s Fair. During his incarceration awaiting execution, well over a century ago, Holmes admitted killing 27 innocent victims, but the evidence the author locates indicates hundreds more likely. From his investigation, Jeff Mudgett, the direct descendant, learns that Holmes’ reign of terror was worldwide and not limited to Chicago as has been so widely believed. Based upon never before revealed historical facts, Jeff pieces together a dynamic and extraordinary puzzle, including the strong possibility that Holmes was also Jack the Ripper. Far more than a documentary, Bloodstains is precariously balanced on the very edge between non-fiction and the paranormal, as the author’s research of his evil ancestor quickly takes on a personal aspect. Jeff soon fears his efforts may have awakened the legendary ‘Holmes Curse’ of the 1890s, the one investigated and written about by most of the nation’s major publications, including The New York Times. In fact, the deeper he digs into Holmes’ devilish past, the stronger the monster’s hold on him seems to become, testing the limits of his own sanity, as well as humanity. Racked by a mysterious and never before experienced epilepsy, Jeff suffers crippling grand mal seizures whenever he disobeys the haunting voices in his head. Finally, with nowhere else to turn, Jeff is forced to make the decisions of his genetic lifetime in a life-or-death struggle in order to win the greatest prize of all: his survival. The event in Balboa Park is open to members only with a maximum of 30 attendees. What will you get out of this group? • You will have an opportunity to meet professional writers, hear how they got into the business and how they stay successful. • You will have an opportunity to meet agents, editors and others in the industry. • We have meetings where we concentrate on cover letters and brief elements of your entire packaging and platforms (such as agent and editor cover letters, social networking, proposal and project). • We do not sit around reading our work. That’s your own business, though sometimes we will read our opening paragraphs. We do give you a great opportunity to meet other writers face to face, see who’s writing what and perhaps start a writing group. of your own. • This group is also for professional business people who are looking at how to write a book about their core expertise. • We talk about how to improve your platform as far as getting freelance clips under your belt to make your projects more attractive to a publisher.